A rich and moist bundt cake to accompany your cup of morning happiness. 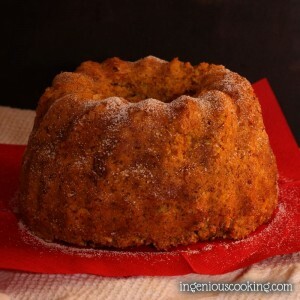 Oil bundt cake form with some coconut oil and sprinkle over with some rice flour. Preheat oven to 160 C / 320F. Mix solid ingredients in a large bowl: flours, almonds, spices, baking soda. Peel and grate carrots and apple. Put in a small bowl alongside coconut oil and water. Heat in microwave until coconut oil melts. Add other liquid ingredients: sweetener, vanilla essence, lemon juice. Blend using an immersion blender. Finally I found a really nice way to utilize leftover almond solids from home-made almond milk - see link tor ecipe above! Once I'm finished with the almond milk, I just store the solids in the fridge in case I plan to bake yet another bundt cake. If you don't make your very own almond milk, try substituting 130 g or 1 cup ground almonds and some tablespoons of water.